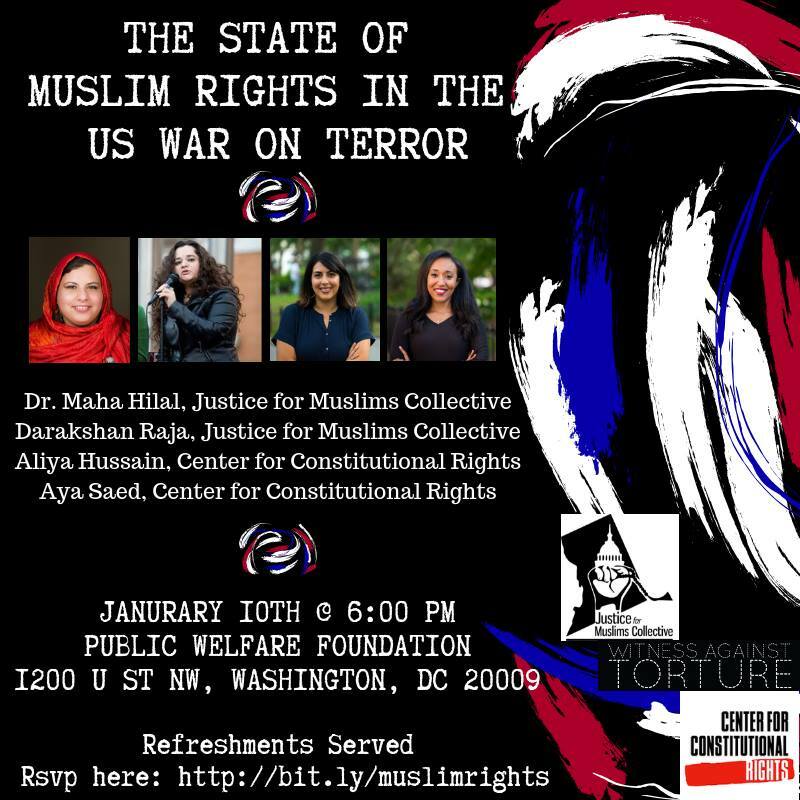 Human rights activists from Witness Against Torture, the Justice for Muslims Collective, World Can’t Wait, the Center for Constitutional Rights and other groups will gather at noon on Thursday, February 1 at the Main Terminal in Grand Central Station to protest Trump’s recent Executive Order on Guantanamo. 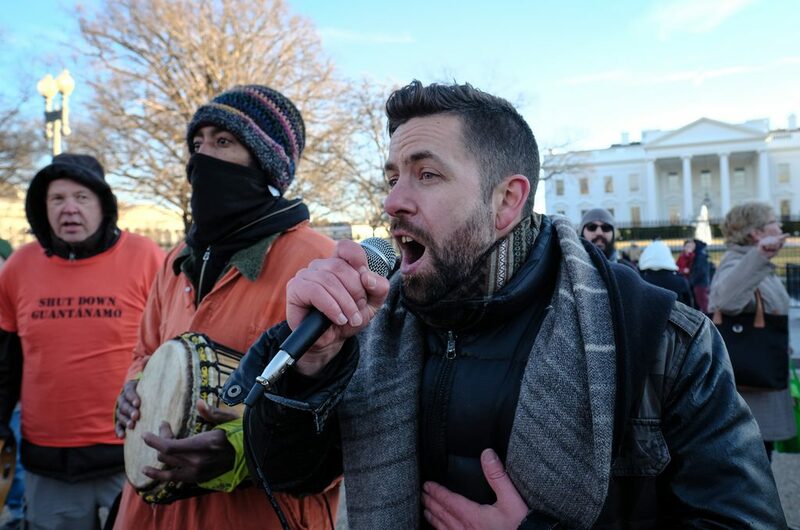 Announced in the State of the Union address, the Order directs that the detention camp remain open, reversing the policy of President Obama to try to close the prison. 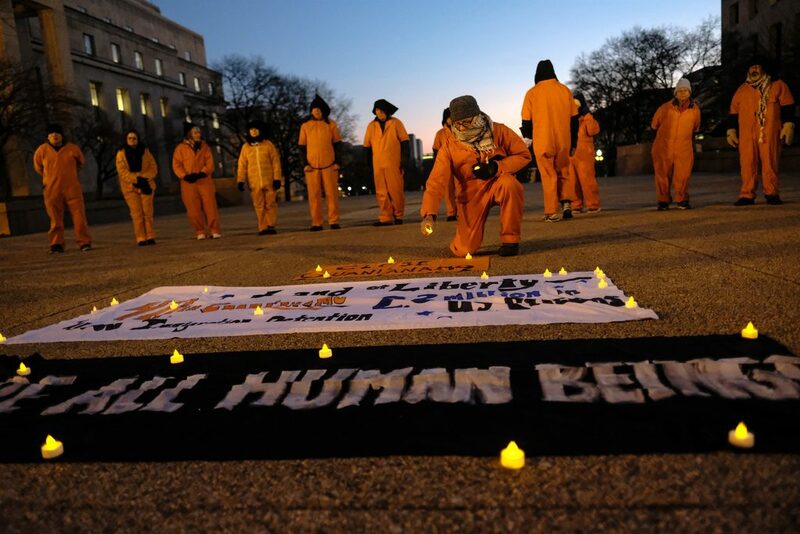 “Forty-one hearts still beat in Guantanamo prison cells. That’s forty-one too many,” writes Kathy Kelly in The Progressive on January 11th, the 16th anniversary of the prison. 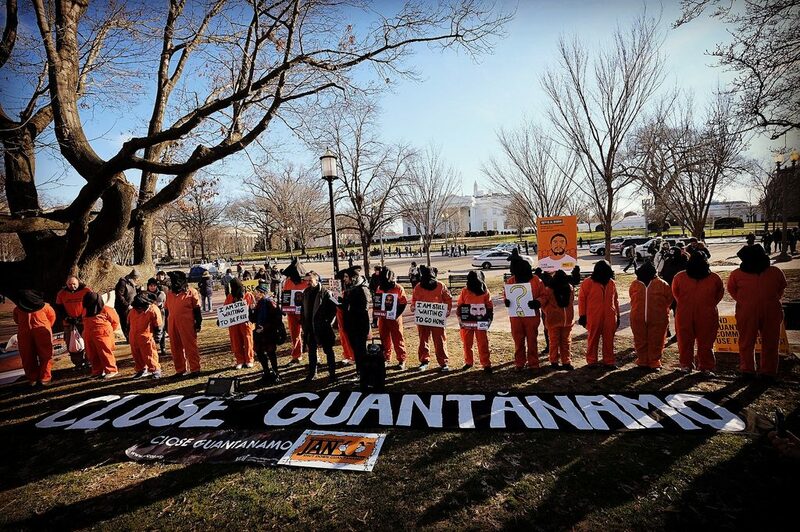 Marking that sad anniversary, we gathered once again along with 15 coalition organizations for a rally at the White House to call for the closure of Guantanamo and an end to torture and Islamophobia. 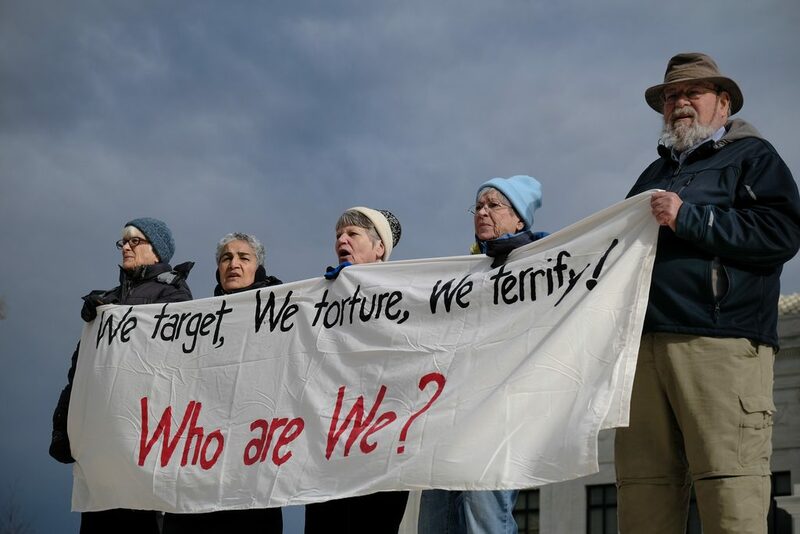 Read Witness Against Torture’s press release about the rally and arrests that followed. For photos from the rally and WAT action, please see our Flickr page. AJ+ did an excellent, short video about the event. WAT member Mike Fiala writes about the action and arrests and reflects on the ritual we incorporated. Following his reflection is another written by Lu Aya Nephew. It moves fast here with Witness against Torture, though not our fast from food – that languishes like waves lapping on Lake Erie. We continue fasting though most of our actions are completed for the week. 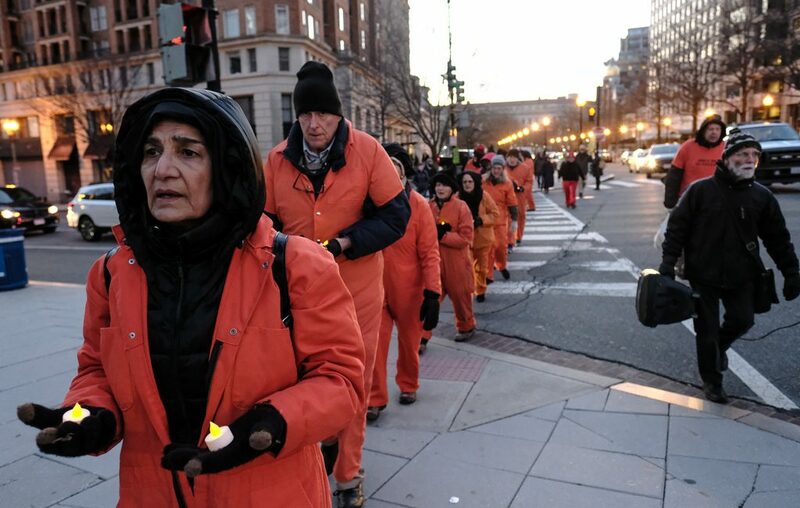 Continuing the fast is a way to keep remembering the men in Guantanamo. Just because we have accomplished something this week with our witness, they are still there, another day, and another day. 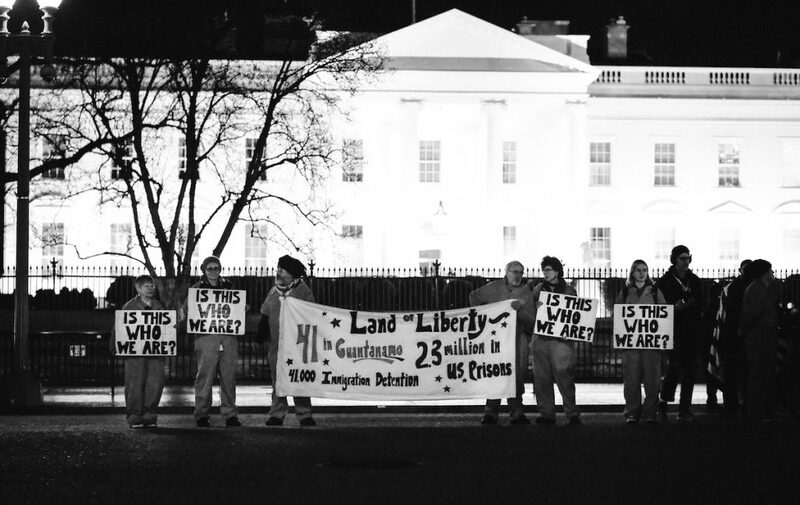 5 people from WAT were arrested at the Jan 11th action in front of the White House. 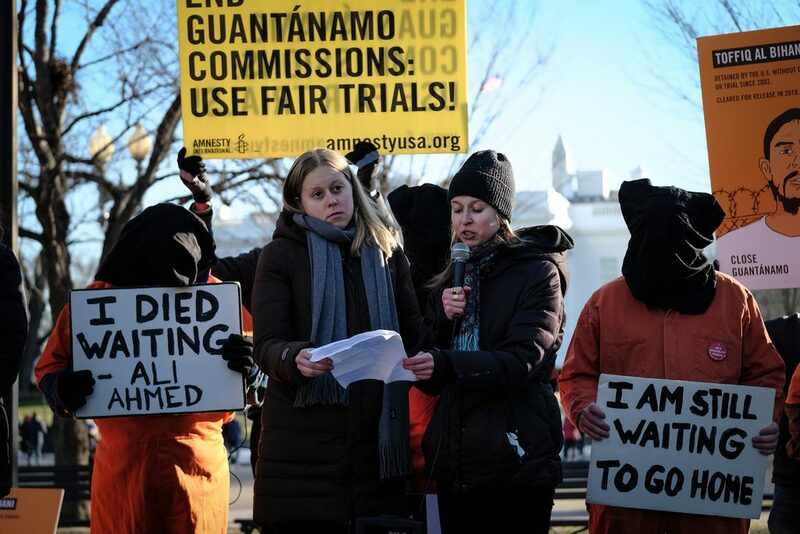 5 Muslim men have been cleared for release and remain in Guantanamo. The five from WAT, Ken Jones, Manijeh Saba, Helen Schietinger, Beth Adams, and Brian Terrell, were arrested by the Secret Service after they crossed a police line, and were then handed over to the DC police. It now appears that even walking on to Pennsylvania Avenue which runs in front of the White House and across from Lafayette Park, can get you arrested. Yellow police tape is ready to be rolled out frequently around Pennsylvania Avenue. 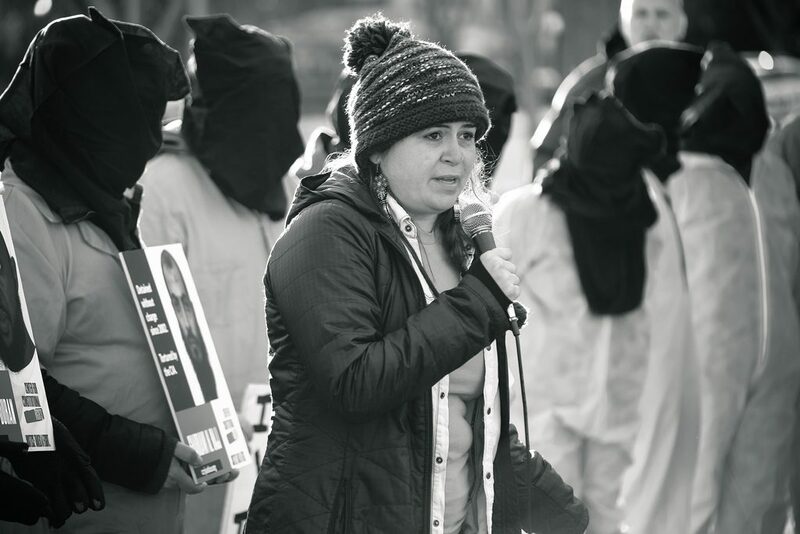 At the rally at the White House Jan 11th for the men in Guantanamo, one lawyer shared a letter, message, from her client in Guantanamo. He appreciated our work and effort at support and solidarity. He indicated the importance of it to him, and others there. 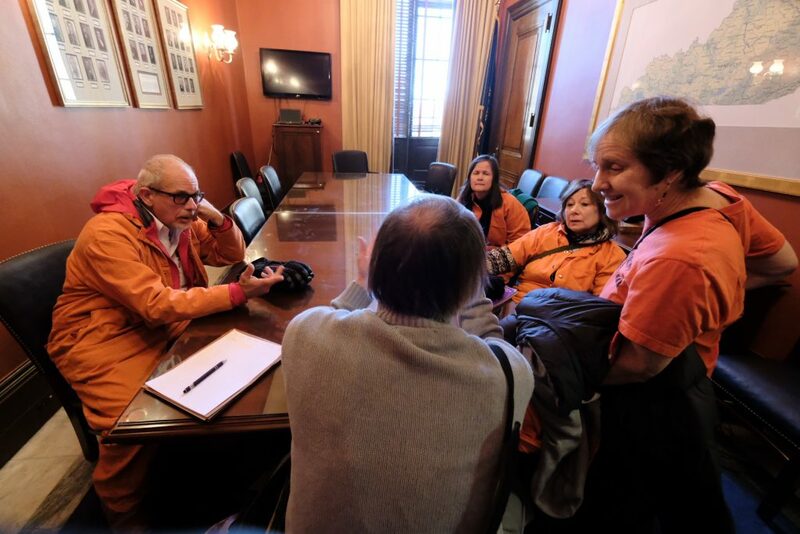 The strength of WAT’s nonviolent actions is to use our bodies as the way to connect with the men in Guantanamo. If they are fasting, we must be. 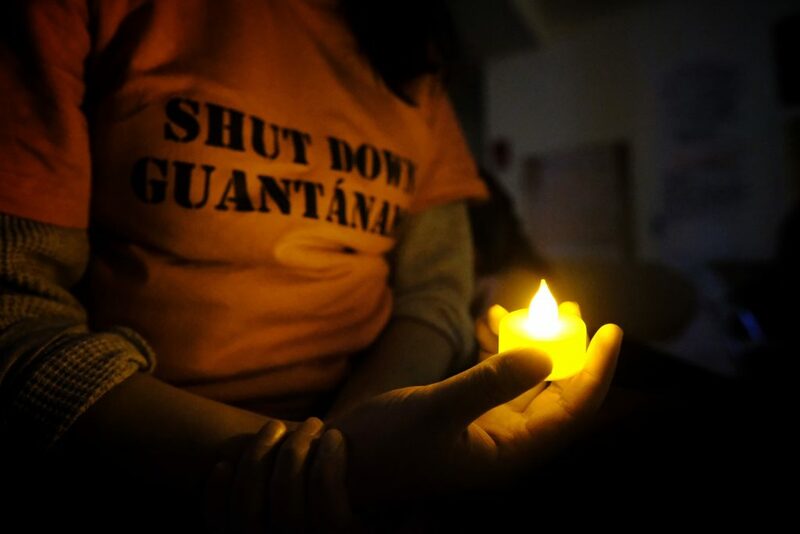 If they are imprisoned, we must be too. And so, when you imagine the beauty of them being released, you imagine what it would be for them to come home to their families. It is among the ordinary things that families do: to serve tea. It’s the essence of refreshment of friendship. warmth and commensality. So, after the rally, with speakers addressing the awful injustice done to these men with their continued imprisonment, we had a tea ceremony as though they were returning home. Each of us from WAT in our orange jumpsuits with black hoods received tea in a cup. 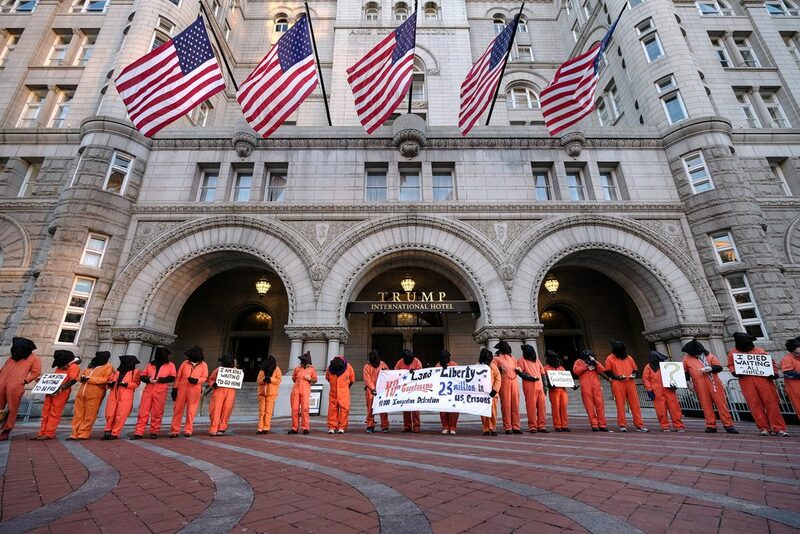 We pushed up our black hood at the offer of tea to reveal a person under the hood, and we were served tea, with each man’s name still in Guantanamo called out. Then we placed our cup, with the man’s name penned on it, on the sidewalk at Lafayette Park, in a row. 41 for the 41 men. Simple acts, simple hospitality. It is the core of being human. It is the breaking of chains. And we could see/believe it happening if only for a moment, in hope. It will happen. It’s hard to trust. To trust that the arc of the universe bends towards justice. So we do something with our bodies to give it a push, to em-body it before it happens. It will be. It will. So, what kind of tea would you serve the men in Guantanamo when they come home? If/when they come to your home? And would you fear it, its fierce reality? What kind of tea did we serve in preparation for their homecoming? Well, let’s go back to the mourning in the morning. The church basement. The imperfect circle. The solemn song. 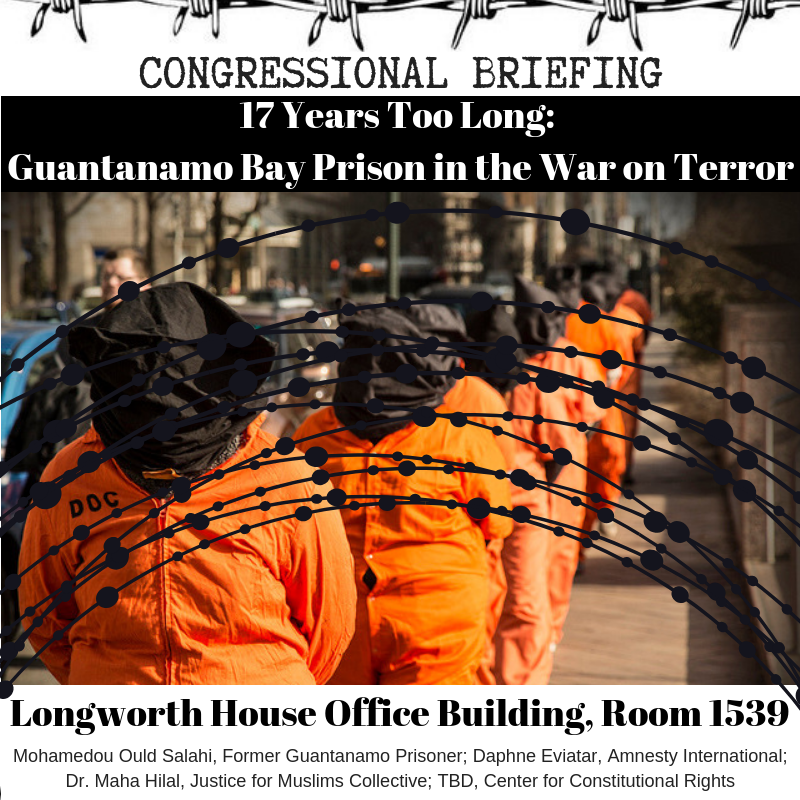 Guantanamo and in so many more prisons. Let’s return to the breath of the tortured. The unheard words upon their tongues. The forty-one beating hearts in their chest. Yes. Let’s return to them. Let’s stay here for a moment. Right here. Heart. Beat beat. Heart. Breath. Breath. Breath. Even as we go on. That rose up higher and realer and wider than the white house. Today A group of us had a real desire to travel from D.C. to Baltimore for a rally against the U.S now having close to 800 military bases around the world. The first people to congregate were three well-dressed men from Nepal who will be speakers in the conference to follow on Saturday and Sunday. Folks representing Japan were there. Demonstrators from Code Pink and “No War,” Our Buddhist monk friends, NCNR and many more peace organizations were represented. Witness Against Torture also spoke up urging our country to finally close the base we’ve been fasting to close all week long. 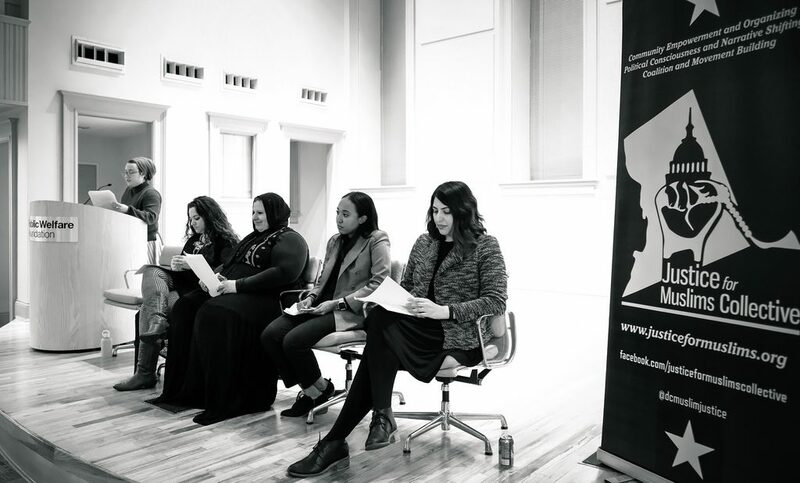 A beautiful sense of solidarity pervaded the crowd of about 50 people. 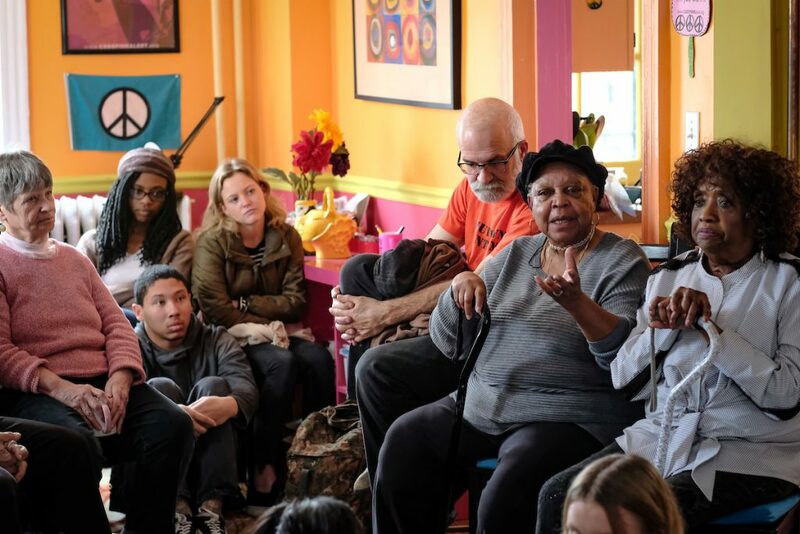 Longtime activists in the anti-war movement stood in hope and endurance beside young people entering activism. This weekend we finish our week-long Fast for Justice with a WAT community retreat ending with a fast-breaking dinner celebration. We offer our readers deep gratitude for accompanying us on this week’s journey. 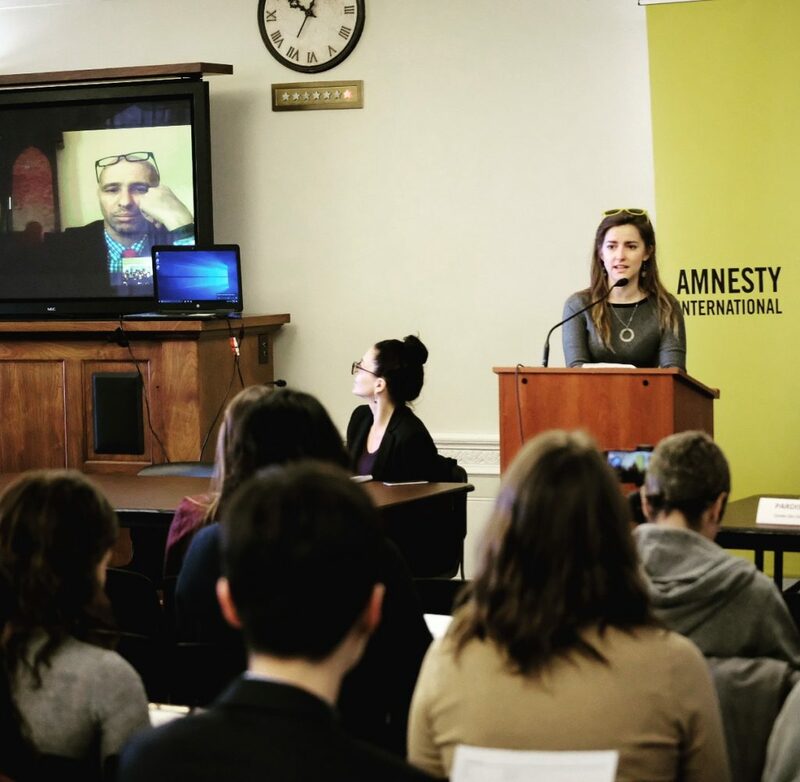 We close with a poem by Towfiq Bihani, a Guantanamo detainee represented by Reprieve. Go everywhere you would like my darling. Dance as much as you would like. Enjoy all the fun you can. My darling, forget your past.